We supply technically sound Breath Alcohol Detector that identifies the blood alcoholic content in seconds. 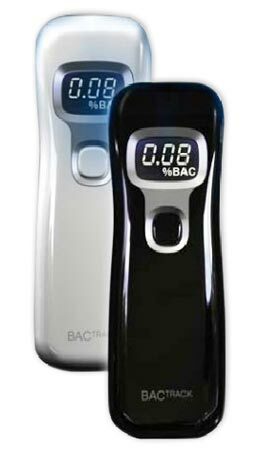 Our Digital Breath Alcohol Detector is available under the brand name of BACTRACK breathalyzer. Digital Breath Alcohol Detector, offered by us, is designed with advanced technology and in an innovative and user friendly design. Salient features of our Digital Breath Alcohol Detector. Today, we have carved a niche as one of the key Electronic Breath Alcohol Detector Suppliers in India. A Circular Light Rings provide a visual target and notify the user when to start and stop blowing. Internal Dual Flow Tube allows subjects to blow from a half inch away with no mouthpiece required. No more sharing contaminated tubes with multiple users or paying for replacement mouthpiece. Patent Pending BluFire Sensor Technology provides extremely accurate test results by steadying airflow and requiring a deep lung air sample for each test. B Wide Test Range - Measures Blood Alcohol Content from 0.00 - 0.40 % BAC. Inverse Lcd Display - White digits on a black background make test results easy to view in daylight and at night. Recessed display helps prevent scratching. On-screen instructions guide users when to wait and when to blow. C One Button Operation- Simply turn it on and begin testing in seconds. Tap-Proof Power button- Prevents the BACKTRACK from accidentally turning on. Hold power for five seconds to display the total number of tests performed. D Compact size and aleek design- easily fits into a pocket or purse. Choose from two colors; polished black or polished white, both with a gloss finish and silver metallic bezel.